I'm really worried about getting squeezed in the H/H department going forward. Arena renovations needed to happen...more on the UD front than to cater to the NCAA. If you've been "behind the scenes" you will know what I am referring to. This renovation isn't "stickers and paint" like the last one. This will enhance the fan experience. You either renovate to the extreme...or build new. New isn't in the cards and shouldn't be. To think that "Satifying the NCAA" in trade for scheduling...you really don't know what you are talking about. Small things...like a pro shop...instead of having the equivalent of folding tables at a pop up shop for merchandise. The corner suites and other "box seats". Form of revenue generation in house...not to satisfy the NCAA. UD is a great host to NCAA events and the NCAA knows that. UD isn't in the business of calling up the NCAA offices and saying "Hey NCAA, do you approve of what we are doing and what else can we do for you?" UD doesn't put the NCAA in front of UD. People about "UD would rather host the NCAA than a home NIT game". No **** Sherlock. No one in the building wants to be in the NIT...so go what what is a guarantee..the NCAA games as well as hoping your team is playing on the road the first weekend of the tournament. To think that "Satisfying the NCAA" in trade for scheduling...you really don't know what you are talking about. UD doesn't put the NCAA in front of UD. Donoher Center was upgraded about 2 years ago. Probably not up to par with LaSalle or Fordham, but I'll let you decide for yourself . . .
Its going to happen to all non Power 5s as they go to 20 game league schedules. Fewer games to play outside their own league, yet the same number of vultures trying to schedule those diminishing number of games. UD is actively trying to find a winnable neutral next year somewhere against a solid team in that 75-125 RPI game which is the same as beating a Top-50 at home. Im not bullish SMC re-newing that series -- took so much work just to convince them to play it the first time. Losing Andy Kennedy at Ole Miss is a bit of a blow. He was always agreeable to a series if the dates and times worked out -- one of the good guys in coaching. We might be able to schedule Pittsburgh again! You are gaining 2, not 1, non-buy games. The idea is to drop 2 buy games in exchange for 2 home and home series, one of those games would be at home and the other away. Adding those 2 non-buy games could maybe be worth as much as a 15 maybe 20? spot improvement in the rpi rankings. In addition, we get 1, maybe 2, quadrant 1 games, an additional opportunity for a quality road win, an improved sos, and 2 more marquee games ever year. We could gain maybe 3-5 spots on the seed, like going from a 7 to maybe at most a 2. 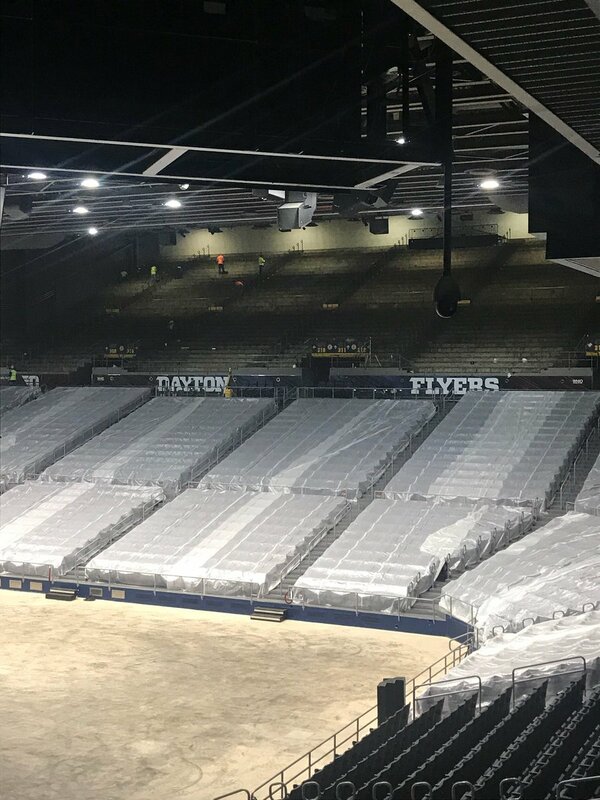 Everybody cries on here all the time about UD not being able to afford to do this, but yet here we are doing a renovation that is in the tens of millions of dollars. IMO, it does not all add up. Last edited by ud2; 02-22-2018 at 07:19 PM..
Ah, but it takes two to tango. Just because you would like to schedule P5 teams does not mean they will agree or even have room on their schedules. As pointed out by others, the number of available H/H P5 games is dwindling. The NCAA needs tongrow a pair and step in. Had to throw out the Ga Tech series because that was a coaching contract requirement. Obviously, I also threw out single games, buys, UDIT/Merrill Lynch, etc. In short, 3 of the 5 Power-5 leagues haven't agreed to a home/home in over 20 years, while the fourth is from a league where we've only scheduled that league in a home/home one time in over 100 years. The 5th league -- the SEC -- is the only Power-5 league with any repeated interest in playing Dayton in a series. Of the Great Independents, Notre Dame has never played us since they have been a member of a league (seriously - think about that), DePaul last played us when they were in their last season in CUSA and first season in the BIG EAST, and Marquette has not played us since they were in CUSA. Keep in mind most of this concrete was in place before the last 5 years of Conference Realignment 2.0 and 20-game league schedules. What used to be improbable with scheduling is now approaching the impossible. One universal truth must be in place for a series to get inked: the opponent must want and need the game at least as bad as you want or need it. Basketball scheduling is not a charity because there is too much at stake. If they don't see enough value in the series to reach their own program goals -- either financial, competitive, or otherwise -- its not in their best interest to schedule Dayton no matter how much Dayton wants the game to be played. Its all going byebye sooner or later. at some level we haven't been a consistent enough program for a lot schools to schedule. " If you go search the schedules of VCU, Wichita, Creighton, Butler, Xavier, Gonzaga doors opened over time for them. Schools aren't going to risk playing Dayton if they don't think their getting a quality opponent both years of the series. I've wondered why Notre Dame has no interest in playing us. You'd think the top dog would throw a bone to little brother occasionally but it almost seems there's no relationship there at all. I find that odd especially since we're no longer a bad loss (present season an exception). I'm almost arrogant enough to think they don't want the competition of similar brands but that seems a bit far fetched. Any ideas? Notre Dame played at Michigan State for the first time since 1974, and Brey acknowledged he has no interest in scheduling a home-and-home series. "It ain't happening," Brey said, adding he would be OK with playing the Spartans every five years in the Big Ten/ACC Challenge. Every time I think “a real person cannot possibly be this dumb,” the same post goes up again. This line of thinking is willfully obtuse and full of straw man arguments. First, NOBODY is crying that UD can not afford to play one fewer home game a year. Some people understand how the scheduling works and some others (such as ud2) simply do not understand reality. Reality includes such things what ud69 just added - it takes two teams to agree to dates and locations, and sorry; that simply isn’t that easy. Even if two teams want to play each other, agree that it would work, there are a lot of moving parts. Several dates are off the table due to planned exempt tournaments. You probably don’t want to have a difficult round trip travel right before or right after a trip to say, Maui, Anaheim, the Bahamas... You probably want a winnable game as the home opener, but a decent school, not a total cupcake for that game. But guess what? So do about 50-75 other schools who are around the same level as UD. You have other schools’ travel in mind too... Ball State was about the perfect home opener for UD this year. A reasonably close, decent school with some veterans returning who will end up decent by the end of the season. You want to play at least one more decent game before the exempt tourney to get some experience and challenge for your team, but depending on the dates of the upcoming tournament and when the season starts, you might only have a handful of available dates. This year for example we played on Friday Nov 10, I think the first possible day we could have. The first game of the Charleston tourney was the following Thursday. Should we have tried to squeeze in a road game on Sunday at say, Georgia? Two days after our home opener, a couple days before three games in four days? Should we have played that Monday? Two days before three games in four days? I picked Georgia because they are a P5 team reasonably close to Charleston, and not already in the event (Clemson, Auburn already in, I dunno if South Carolina would want to play us since AG and Frank Martin are buddies and they are coming off a Final Four...) Georgia doesn’t want to play a Sunday night home game, or maybe even a Monday home game (and again, we’d be stupid to play a road game on Monday before 3 games in 4 days). Georgia didn’t want to play those days anyway, and they wanted a cupcake so they played SC Upstate on that Tuesday. So in my made up scenario of playing one team in that week, there’s a bunch of layers of complication and it just isn’t that simple to call up Georgia and say hey, we want to play you on Monday November 13 at 7 pm - deal? This scenario assumes Georgia would even take the phone call from Dayton asking if we can play them home and home. Before we move to the next point, please try to give me some reasons why Georgia wants to play Dayton in a home and home. Second of all, as many, many, many people have pointed out many, many, many times (and you’re either too dense or too rude to read), our non conference schedule has not been a problem for us in terms of positioning for an NCAA bid. Not once. Not one time. No year in recent memory. We made the NCAA tournament as an at-large team each of the last 4 seasons. Every year in which we were close over the last 15-ish years or so, we were left out because of a poor performance in conference. Please please please find us one instance where UD did not get selected as an at-large team because of a poor non conference schedule. It’s a pretty simple request. Find us one season where UD was snubbed because of our non conference schedule. So even if we magically get two quadrant 1 teams to agree to home and home series, you really think that would improve us 20 spots in the RPI and 3-5 seed lines? Are you serious? If we had played South Carolina instead of Winthrop, and Virginia instead of VMI you think that would have made us a 2 seed last year? That is utter foolishness. Nonsense. Magical thinking. Poppycock. Maybe someone can crunch the numbers and see what a road win at Virginia (and by the way, yeah right we are going to win @ UVa) and a home win vs the Gamecocks would do to the RPI but you think that would be 20 spots better and 3-5 seed lines? Even if we operate under the outrageous assumption that we would win both of those games, that’s highly doubtful. This also assumes that Virginia wants to play a home and home with Dayton AND they can start at home on Dec 23 AND host Dayton in between road games @ Cal and Louisville AND that UD wants to play @ UVa two days after hosting Vanderbilt AND that South Carolina wants to play a home and home with Dayton AND that they can play @ UD on Dec 3, two days after a home game against Vermont. Then, you think we would win two quadrant 1 games, one of which is on the road, and this would help us because we would... make less money by giving up a home game but make up for it by getting a two seed? Um, okay? But you’re suggesting that should be paid for because we play one more home game a year? So, let’s say UD clears $1,000,000 profit for a home game (I doubt the number is that high, but this is for argument’s sake). In the one extra home game per year, it would only take us until about 2080 until we raised enough to pay for the Arena upgrades. You’re arguing that UD thinks this is a good idea? Or are you arguing that the two extra quadrant 1 victories a year would get us 3 or 4 more NCAA credits a year every year and then... we’d have enough to finance the Arena upgrades by 2030? It is just so weird that you continue to make the same uninformed, ignorant, foolish arguments, don’t actually understand any counterpoint, don’t try to learn anything, and just spew the same garbage in post after post, thread after thread. It is so tiresome. Hence my reference to throwing little brother a bone. If that would happen in the business call Men's Basketball one could imagine it might occur in 2 like minded institutions sharing a common faith. But I see that's completely naïve. And? You think that despite all evidence to the contrary, that we could just get two P5 teams to play us home and home if we say pretty please? And that we would win those games? And that this would improve us 3-5 seed lines? And that would help us pay for Arena upgrades? Please explain, cause I do not understand this line of thinking. In my example above, you think we should have played South Carolina and UVa instead of Winthrop and VMI? And that we would have won both of those games? And that would have gotten us a better seed? And that we would have therefore made the sweet sixteen and Archie never left and Deandre Ayton would have assumed his rightful place as D Ayton in Dayton and then we could have paid for the Arena upgrades? I’d be happy to respond to an actual argument. Are you arguing that we should play an extra two home and home series? If so, who? How? Why? Of course the last two years we garnered 7 seeds. Do you think we would have gotten a better seed if only our non conference schedule had been better? If so, who should we have played and how should we have gotten those games to happen? Who would you take off the schedule? I'm happy with our scheduling for the most part. Neil doesn't have any easy job and there's about million articles from the national writers backing up the difficulty teams in our position have in that department. Only thing I would change is in the rare year like last year for instance. When there's a very good chance the team is going to be in the tournament. We're playing for seeding. Consider an extra neutral site game, series starting on the road or a one off road game in place of a buy game. If a team can't be found so be it. I think the scheduling model is fine but some slight variance is justified if there's a team worthy of it. 2-3 less home games a decade. Anything that can be done to get us out of the 7/10 and 8/9 games on the seed line. I appreciate this line of thinking. Last year UD played Northwestern--which we lost unfortunately. Win that game and most likely not stuck with Wichita State. I agree with the concept of considering 2-1 or even a buy game at a Duke or N. Carolina SOME years like last year where there is a high probability of NCAA. I get this isn't always possible because it takes two to tango. Also, what I have no visibility to, perhaps UD has tried some of these less conventional approaches but still getting no takers? Good post. I totally agree that getting us off the 11-10-19-8-7 lines is key but that’s actually a pretty big step up. UD is in a weird position right now as Chris outlined above - there simply aren’t many great options, and as long as we have 18-ish games vs the A10, it’s gonna be tough to move into top-6 seed range. Heck, we are barely top 6 seed in the conference this year! My main point was to demonstrate how awful ud2’s point is. The same one he makes in post after post despite mountains of evidence against it. There is nothing stopping UD from playing good non-p5 opponents if the p5 will not cooperate. We played Murray State in a 2 for 1 and Illinois State in a home and home recently. We lost both road games. 1 of the losses was a q1 loss and the other was a q2 loss. Why don't we do that again if we are looking for more q1 and q2 wins? We should not be picky about where we get our q1 and q2 wins from. Other non-p5 programs are doing better than us, and they are playing a 15/15 at least some of the time. I do not think that is a coincidence. Finally, we have never played a 15/15. What the heck? Why not? People waffle on here, the reasons given for no 15/15 are either #1 $, or #2, people will not play us. I just above proved #2 wrong. So, $ is the reason. UD cares more about $ than winning and fielding a top notch program. This year, 52, was an anomaly. We are usually anywhere from the upper 60's to the upper 90's in overall sos. Teams like Xavier, VCU, and Temple routinely had/have a sos of 60 or better when they were/are in the A10. I do not see why we can not match them. We have only eclipsed 60 5 times since 1993-1994. Relying on buy games for your sos is a very risky proposition. Sometimes it works, sometimes it does not. This year it worked. That is exactly what I am saying. And if we can not get the p5 to cooperate, then take the best non-p5 team that you can find. Get rid of 2 buy games and replace them with 2 home and home series. Start one series on the road, and start the other at home. And just repeat this every year. I definitely think that we can find some willing partners to get more chances at more q1 and q2 wins. Q2 road wins go all the way up to #135, it should not be hard at all to find willing partners that fit that profile. And a q2 road win is the same as beating #31-75 at home. Last edited by ud2; 02-24-2018 at 03:54 AM..
Why not? 2 more home and homes would give us 2 more opportunities than we currently have. 2 more games every year, I think that is significant. Last edited by ud2; 02-24-2018 at 05:26 AM..
Ok, so if we can afford a multi-million dollar renovation, then why can't we afford 1 less home game? That is my question. Ok, so fine, find the next best non-p5 team. 1. The cost/expense argument has been brought up MANY times on here, so I absolutely disagree on that point. 2. Ball State was our best ranked buy game this year, so I disagree there with your facts, but I do agree on the need to open up with an easy/easier buy game. 3. We just made the NCAAT 4x in a row. The best seed we got was a 7. Are you satisfied with a 7 after the best run in school history? Under Archie, we were at the point where we were no longer playing to make the NCAAT, we were playing for seeding. I feel like it is time to drop 2 buy games. I agree that the schedule is not preventing NCAAT bids, as I have acknowledged SEVERAL times now. 4. Playing 2 home and homes would help us with seeding. Yes, we would obviously take a small hit with $. 5. Please explain again your second to last paragraph, I need that spelled out to me again, I am not sure if I am understanding your explanation. 6. I just do not understand how several of our peers have been able to play a 15/15 over multiple seasons, but we have not. I will agree that things have changed recently, so there are fewer opportunities and things are more difficult now, but can you honestly tell me that NOT ONCE OVER THE LAST 30 OR 35 YEARS, that we have not had the opportunity to exchange 2 buy games for 2 decent home and home series? I simply can not believe that this is the case. THAT TOTALLY STRETCHES CREDULITY! 7. Rpi wizard: drop the 2 worst buy games, Tennessee Tech and Georgia State and replace with a home and home against #42 Boise State and #46 Temple. I bet Boise and Temple would agree to a series. Is that a reasonable assumption? Yes or no? I think that could be worth maybe a 2 or 3 seed improvement. So, go from a 7 to a 4 or 5. Am I wrong? Last edited by ud2; 02-24-2018 at 05:24 AM..
Biggest upgrade coming to the arena will be top recruits and a return to Dayton Flyer basketball. I will pick this thread back up shortly/eventually, I am just too busy right now to devote my full attention to it. It might not be until the off-season. I hope you are talking about upgrades to the arena. Despite being a rabid fan of UD for decades (spending many years living in the area as a kid) I bring a new set of eyes to the UD campus having a D attending today. I'm reading about our challenges recruiting 4* players, the spotty at times attendance of students, etc. I have posted before that I view the Arena/practice facility upgrades & the campus itself as world class, able to compare with any program. The small downtown also nicely compliments the campus. Leaving our A-10 affiliation out of the discussion, the one thing missing from the total curb appeal package is the lack of transition/walking access from campus to the Arena. Note that its just not the basketball arena there, there is also a football stadium, baseball & softball diamonds, etc. 1.6 miles separate the arena from campus, and while the MBB season is in winter and thus walking may not be a real option most games, I believe the university could do something to cost-effectively (perhaps with the city) make the connection much more attractive. Perhaps a "boulevard-like" string of trees, benches, access to the river, a bike/jogging path, engage our corporate partners some of whom have offices along this path. Maybe encourage some entrepreneur small businesses like a restaurant or pub. We pull this off and upgrade our conference and there is no stopping us. (I know the fairground is an asset that could someday also tie into this). Richmond is dropping 15 million on a new practice facility. Is the Cronin center getting left in the dust? UD has great tradition, but I don't think they do a good job of advertising it. Great Idea! I talked to someone down at the arena a while ago and suggested that they save the fronts from the old scoreboard and hang them in the concourses and use them real time. Great nostalgia and repurposing. They actually thought it was a great idea, but they were destroyed right after removal. Speaking from the vantage point of having been at ND for a number of football games over the past decade+, I think they view any school that doesn’t play D-1A football as small potatoes. I’d need to research this, but I don’t think they’ve played DePaul or Marquette since the breakup of the football-centric BE earlier this decade, and Chicago and Milwaukee are closer to South Bend than Dayton is, and they’re decidedly more “big time” as cities, too. Why doesn’t ND play all of their old “Great Independent” rivals from the ‘80s? I believe it’s because bowl-eligible football drives that bus. They played at DePaul to open their new arena. Maybe they'll play at UD in a couple years to open our "new" Arena. OSU has agreed to open UC's Fifth Third Arena. Could we get UC or OSU to open our arena? In phase two, new club seats will be added between the 200 and 300 levels. In the past, an aisle separated those levels. That aisle will no longer be on the east side this year. Fans in the 100 and 200 levels will walk up and exit to the concourse, while fans in the 300 and 400 seats will walk down and exit to the concourse. Are we able to take recruits over to the Arena? Article says it won't be a closed down construction site until after the May graduations (May 6) I think they will be able to take them in with hard hats after that, but that's my guess. I was lucky enough to get a mini tour of the arena yesterday to look at some of the new club seats. The club seats will be located where the side concourse is now, there will be two rows of seats. Interesting is that the there will only be one row of center court club seats, and they will be the rear row. In front of that will be ADA seats. The ADA seats will only be located on Edwin C Moses side - due to the shorter distance from the parking lot to those seats. They are will underway with building the new outer ring concourse. The new terrace suites will have 6 seats and 6 standing seats - 12 tickets total. Those provide a really cool view the court. I think he told me that 2 or 3 have already been purchased for the season. And I think the corporations that purchase those will be able to "brand" each of the terrace suites with their corporate logo. Another interesting thing is that you know those diagonal/corner areas where people stand on the main concourse to watch the game as it is ending to get a quick exit from the arena? They are going to install a long bar type table there with maybe 12 fixed chairs for new seats to sell. They will do that in 2 of the 4 corners. Those will be really cool seats. First of all I need to say that I drink the UD kool-aid. But I truly believe, when the renovations are complete, there will not be a "cooler" more "unique" place to watch a college basketball game in America. There is no arena like UD Arena. The angles. The intimacy. The design. Most larger arenas are all alike - indistinguishable. UD Arena is truly iconic and a gem. What twitter alias posted these? Just curious so I could follow. WRGT had some drone footage of the work being done. Improving the access and bottlenecks to the concourses will be a big, big improvement. Can't wait to see that project completed. Especially when visitors are here for the NCAA and don't know the layout. Only two concourses will expanded this summer. The other two will done next summer. I must be in the minority here, but I liked the interior concourse. I dislike all other arenas with exterior concourse. The interior concourses are a huge huge bottleneck. Extremely crowded and slow. 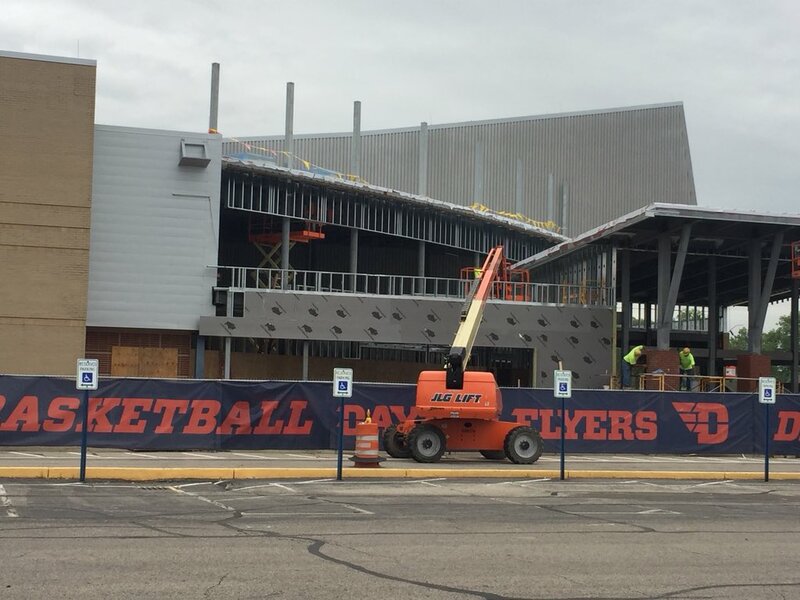 UD's new exterior concourses are going to be quite unique. You will still be able to see the court at each "corner" of the arena. Going to be immensely more spacious. Cannot wait to see it completed. It isn't a huge deal during a home game where every fan knows where to go and when to go. NCAA time...it is a hot mess. No one can find bathrooms as simple as the layout is. I drove by the arena the other day, you could sort of see a little bit into the inside of the arena from the parking lot, there was a construction opening/hole on the north side of the building. You could not see very much at all, but that was an interesting perspective, being able to see inside from the parking lot. The north side circular concourse base steel structure is in. 2 weeks ago the middle sections at the north entry doors weren't together. 1200px width image available here. Yes, I watermarked it. Image ownership, and all. That hole to the right of the 2 L's in the word basketball, on the tarp wrap, looks like the hole I was talking about. More pictures from the arena this Sunday. Work ongoing on the upper deck table top hallway. 2 different angles, and the brick work on the maintenance area almost complete on the northwest corner, can be found at Figstats?postDate=20180701. Last edited by Figgie123; 08-19-2018 at 10:01 PM..
2 more vertical supports are up on the east side, and they are getting close to beginning the brick work on the new entrance on the north side of the arena. More pics of the vertical supports, a view from the north west showing a nice view of the curvature being built, and a look at the south east new entrance with the vertical supports on the east at Figstats. Last edited by Figgie123; 08-19-2018 at 10:00 PM..
Is there an architect's drawing of how the facade of the Arena is supposed to look when completed? I was wondering if the upper areas of the Time Warner and the Boesch Lounge was extending out to the curved area as well. Thanks, Figgie! Outstanding design, IMHO. Clean, crisp lines of sight, nice spacious promenades around the building and the concession areas seem to have made it into the 21st Century. Well done, UD and all those that supported this project. Kudos to all. Now, I guess all we have to do is pray the roof doesn't cave in half way through the project like it did during initial construction! You better get there before that thing literally takes off!! It's about time...I've been pushing for this to happen for 5+ years! So does this mean we P*** directly into the keg for you Bud Lite drinkers? Last edited by ClaytonFlyerFan; 07-31-2018 at 01:24 PM.. So 90% of the waste will be recycled or composted...and that is "zero waste?" Hmmm...I must have slept through that math class. Is this the "new math" approach, or perhaps some "common core" math????? Since not every option in food prep/service is recyclable or compostable, 100% is impossible. And FWIW, 90% is pretty easy to achieve once you beat down the suppliers to provide you with cups/plates/boxes that are easily separated. Ohio Stadium, with 108k fans on a given Saturday, achieves upwards of 97%, but they've been doing this for over a decade. UD will easily reach their initial goals and with the support they are receiving from above, will quickly get to >95%. Stay tuned. They can just run a beer tap to my seat. And a catheter to the river??? I believe only the East Wing. This is because it is part of the new upper 'deck' and walk around area at the top of the upper 400 section. An elevator will get you up to this new area. I haven't seen any plan that showed the same situation for the opposite wing. Other than additional cost, I wonder why it is only on one side? The additional cost is significant. And... the West side doesn't face any significant thoroughfare. The East side is viewed from 75N, Edwin Moses, Patterson Blvd., the Carillon etc. Pretty sure that's the reason. You have the Donoher Center wrapping around that side of the building. It would require some Donoher Center demolition or serious engineering for support columns to work around it. IMHOP- cost prohibitive. 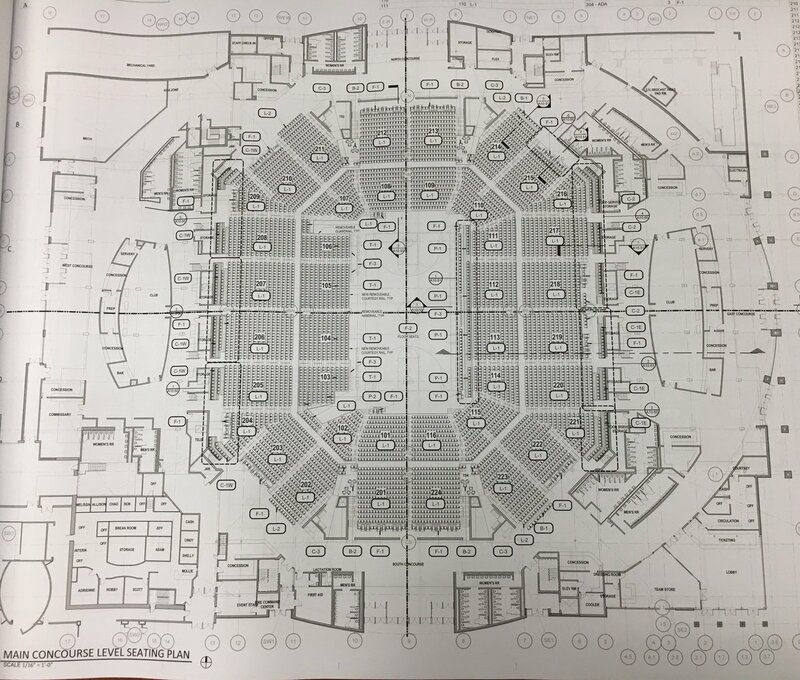 Backtracking through Dayton Daily News archives, and twitter posts, here is their blueprint image: DDN Image of Arena Blueprint. On the right side of the image, you can see 8 small squares just outside the circular concourse. Those are the structures that have gone up in the last month. If you look to the left of the image, though, you will see NO squares there. So, it appears, the 400 level walkway/bartop area, with elevator and windows is only on the east side. I've been combing through the pictures and videos, and not once do they show anything except the south and southeast side of the arena. Must be the reason why. Barely visible from 75N. You can see the 400 upper deck wall on the West side of the arena from 75N, while you can't see the East side wall at all. Scroll through Google Street View and you can see that. I don't think the Donoher Center truly blocks the area needed for construction. Either the blueprints, or a Google Map view will show that where they are putting the support structure for the 400 area could be copied to the west side of the arena with only a little impact. Basically, the loading dock (which doesn't seem to be moving based on the blueprints) and the entrance to back of Donoher that the band (and Flyer Ball Kids) take. The 2 white structures that were outside the east end were demolished, and still exist on the west side. They also aren't making much of the curvature to the outside building structure on the west side like they are doing on the east side, though, they have been working on the outside curvature all the way to the north west area where the mechanical room is going. I think it would have looked amazing with both "wings" glass but it must have been a cost issue. Still will be something to behold. Roof structure for the east side walkway is in place, and they are working on the concourse structure for the southside entrance now. Also, windows going in on northeast side, and support structure for external windows going in for the second floor on the northwest side. Those pictures at Figstats. Last edited by Figgie123; 08-19-2018 at 09:58 PM..
Figgie, thanks for the great pictures, but your Fidstats across the pictures distorts them. Is that necessary. It appears that the fire did not stop any construction work. 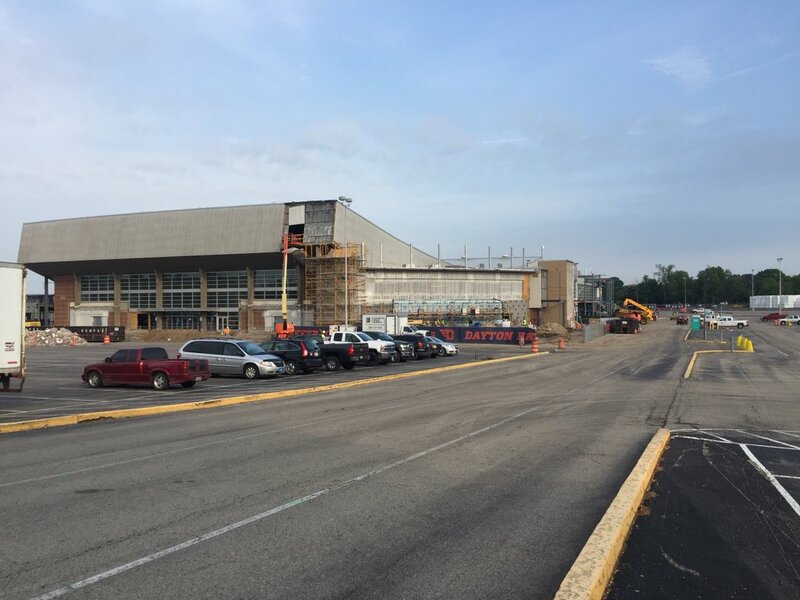 Roof on the 400 walkway is on, most, if not all, windows installed on northeast side, brickwork beginning on north entrance side, more steel structure on the south entrance side, and support structure for windows on new south east main entrance. Here is the shot of the northeast side of the arena with brickwork and windows installed. 5 more images at Figstats. Keeping all of us informed about the goings on at construction site USA! That is to say UD Arena. Thanks again for on the spot great coverage of this ... Lets hope the construction going on with the 2018-19 team is moving as well as this is! Got to tour the Arena yesterday and found out a few interesting things. First, they are going to move the four corner scoreboards up towards the 300 area. But what is interesting is that they are going to put in 4 "party decks" that can be rented in the area near where the scoreboards are now. Basically in the area north and south of the Flight Deck and the Lounge. With building out of the new concourses, I think that gives them a new floor under that area. They will rent those to companies or large groups. They are tearing out all of that silver aluminum look material that is on the walls to open it up now. I hope that makes sense. Next, where the south wing is now, the new "club" will be in the middle of it, with a small concourse on each side of it. Picture the wing area now, and then of a large rectangular enclosed area in the middle of it. That will be the new club. They are doing much more than just half of the work this summer. They have now started framing in the new back corner concourse - opposite the Donoher center near Welcome Stadium. They have also started framing the area that will expand the Boesch Lounge where the ticket office was. Was told that the lounge and flight deck will each have an additional 1,800 square feet. The new ticket office will be in the far right area of the arena if you were looking at the old ticket office - the new construction near ECM Boulevard. It will be inside in a two-story area, all glassed in - but open air - there will be no walk-up windows - just a long counter. We all know those 4 areas where people will stand at the end of the game to make a quick getaway - the area on the concourse, behind the seats. That area is still going to be open to view the court, but it will not be on the concourse anymore. They have decided to put up long bar type tables there to sit at and sell those as seats. Great idea. Finally - they don't have enough club seats to meet demand. So some that want them, will not get them. The club seats will be placed where the old concourse was. Great problem to have. The brickwork on the first floor of the northside seems to be complete. You can see where the ticket windows will be. Window steel structure is going up there. You can't see it here, but the 'University of Dayton Arena' letters are still up on both sides of the arena, just a bit hidden unless you are far enough back to see it. More steel structure on the east wing on the vertical steel structure, as well as for the circular concourse. And the first windows are going in on the street side of the main entrance. With windows at the top of the east side and with counter type seating, there should be some lighting up there. I hope they can somehow have some soft backlighting along the back wall of the west 400 sections. This has kinda been one of the few sore points I have with the arena. The upper sections are not lighted during the games, so when the games are televised, you really don't see how many fans are passionate about our Flyers. Don't light the whole upper portion, but if the back wall was lit, that should be enough to show the viewers the arena is packed. I think Figgie is our very own beat reporter on this whole Arena thing!